If you are an IT professional, you are aware of the influence of Big Data and its impact across domains and organizations. Big Data has taken the IT world by storm and is the next big thing after the Traditional Database Management Systems. 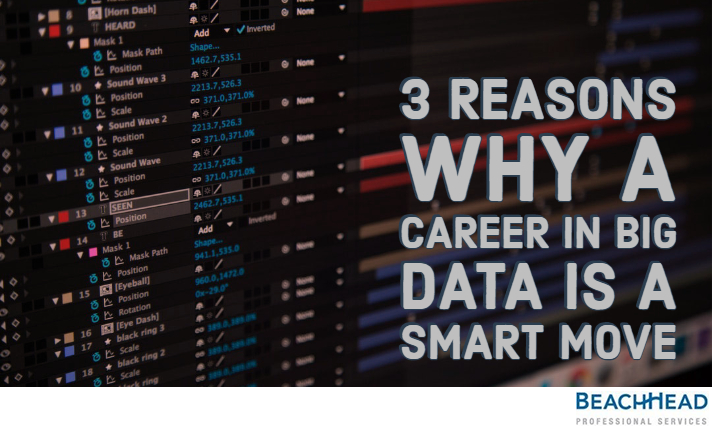 Exploring a career in Big Data is a smart move. Read on to find out why. Digitalization has created huge volumes of data. Organizations today, face the struggle and subsequent business opportunities from data storage, data processing, and analysis. Highly skilled professionals are in demand by our clients. IT Professionals, who would not only understand the data complexities but would also process and analyze large data sets to draw meaningful insights. We know you’re still wondering, whether a career in big data is worth your time, efforts and money, read on. As per the recent forecasts of the World Economic Forum, the demand for Data Analysts will soar globally by 2020. This is backed by IBM, which claims that the annual demand for Data Scientists, Data Developers, and Data Engineers will lead to approximately 700,000 new positions by 2020. Based on this data and a significant increase in the hiring for Big Data Analyst positions by our top financial clients, we can certainly say that there is a huge demand for data professionals. As with any IT skill that is growing significantly, skill shortage for big data professionals is a major challenge across the world. According to a study by McKinsey Global Institute, the US will witness a scarcity of around 2 million Data Analysts and 1.5 million Managers having expertise in leveraging Big Data technologies in 2018. Now is the time to hone your Data Analytical skills and hop on the Big Data revolution. Earlier, there was a lot of misconception involving Big Data technology. It was believed that big data was only applicable to the technology sector. Today, we see it as a means to attain cost-effective solutions and improved decision making across an array of industries like retail, logistics, banking, insurance, healthcare, and government. These industries continuously utilize big data technologies and tools across verticals for business intelligence, data mining, and predictive analysis. Expertise in Big Data would give you a lot of freedom to move across multiple organizations and domains. As a result, you could develop a strong knowledge of the technology and its applications over multiple sectors. This alone would make you an invaluable asset to any organization. Analytics is all set to take center stage in the key decision-making process in the future. It will play a vital role in galvanizing business strategies as well as in making strategic consumer decisions. Although companies are collecting huge amounts of data, there is a huge chunk which is unutilized and untapped. Organizations need skilled professionals for analyzing data and driving meaningful insights, taking their organizations to new heights. This is further validated by the ‘Analytics Advantage’ survey overseen by Tom Davenport, which says ninety-six percent of respondents feel that analytics will become more important to their organizations in the next three years. There you go! With more and more organizations looking to harness the power of Big Data technology, there will be a compelling urgency for skilled people. If you are an individual who can think from the point of view of business, understand data and come up with deeper insight, you will be in great demand! Want to hone your big data skills? Check out our recommended Big data Certifications. Already a big data expert? Check out exciting opportunities with our top financial clients here. You can also send us your resume at info@beach-head.com. Do comment below and let us know if you’re thinking of a career in big data and why. Remember to follow us on LinkedIn and Twitter and do like us on Facebook.